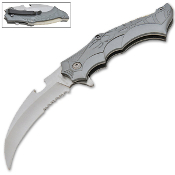 Grey Widow's Claw Spring Assisted Opening Pocket Knife - Heavy duty pocket knife featuring an aluminum handle with a spider and web theme. Razor sharp 440 stainless steel half serrated "claw" blade. Handy pocket/belt clip. Spring Assisted Opening - A simple nudge of the thumb stud and/or index engages the opening action. Strong springs take over and ensure that the blade opens lightning fast and "snaps" into place. The liner locking mechanism with thumb grip release keeps it firmly locked in place. Very high quality construction utilizing torx screws and steel components.